Pandora’s Charm - 10 y/o 16.1 hh thoroughbred mare for part board. Pandora is a well schooled mare who loves having a job and loves to please. Last year she evented to pre-training on the OHTA Circuit on her first year showing! Pandora has 3 well schooled gaits, excels in her dressage as well as over fences. This mare will jump the moon, is brave to boot, and as calm as a cucumber! She hacks well alone or in a group and is quiet in the cross ties. Great brain. Perfect opportunity for a young rider or adult wanting to learn eventing, and ride a talented horse. 3 rides a week. Lessons are mandatory, and showing is very much an option. Boarded at a beautiful facility in Acton/Erin with easy access from Burlington, Oakville, Mississauga, Georgetown or Guelph. 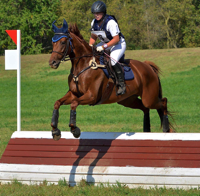 Will lease for eventing, jumpers or dressage.